I graduated with my High School Diploma from Crocus Plains Regional Secondary School, in Brandon, Manitoba in 2012. I enrolled directly into Brandon University after my graduation, with the intention of completing an Environmental Science degree. During my second semester, I decided this was not what I wanted to do with my life and left school. I enrolled again at BU in the fall of 2013 after realizing that school was a good direction to go in. I dropped out again that same semester, very unhappy, and without any desire to pursue school. I knew I had to do something with my life and sitting at home wasn’t going to do it, so I signed up for classes in second semester. Sadly, I ended up dropping out again after two weeks of class. Although I felt the pressure to continue my education from my parent and society around me, I had not found my own passion to continue with university (clearly, as I had already dropped out three times! lol). So, after two years of working, and even a stint of living in Hawaii, I decided that I wanted to go back to school. The difference this time was that I was doing it for me. I am now in my fourth year of my 4-year Bachelor of Science honours degree in Geology with a minor in Geography. This year the students in the Geology Department at Brandon University put on a very successful four-day Geology conference called the Western Inter-University Geosciences Conference (WIUGC) 2019. The conference was organized fully by the students on the WIUGC committee and I had the honor of being the president of the committee. The conference is one of the largest gatherings of undergrad Geoscience students in Canada. I am very proud to have led such a great team in the efforts of putting on the conference. I am also proud of my academic achievement; especially considering I was a three-time drop out (lol). I was born and raised in Brandon, MB. I love this town with all my heart; it houses the friends and family that hold me together! (I love you Mom! Thanks for making me food!) That said, I am so excited to get out of here when I graduate! I have always loved traveling, as reflected in my three-month stint living and volunteering on the Big island in Hawaii, managing a grounds crew at the University of The Nations. I absolute love the outdoors; it’s a large part of the reason why I choose to study Geology, as it has a great deal to do with the outdoors. I always knew I wanted to go into Science. That was evident, as each of the three times I tried school out I choose all Sciences. My pull to Geology came from a long love I have had with rocks….yes rocks, and yes I know Geology “ROCKS” and that it has no faults (my Geology comedy career is progressing too!). From my first Geology class with Dr. Pattison and my amazing lab instructor, Peter Adamo, I started to wonder more about the processes that are occurring under our feet every day. The more I learned, the more I started to piece it all together. I think it’s the building of the puzzle, and telling the story of the earth and its processes, that fascinates and engages me. I know it sounds cheesy, but think about it: everything on this earth has come from some process; even your coffee this morning has a process and history behind it. From coffee beans to coffee grinds, then into a filter, and with the power of water, now they are in your cup. Rocks are the same way. They all originate from some type of process, and it’s the geologist’s job to understand the infinite details of what that process is. They become the story tellers of the rocks, unwinding the earth’s mysteries and discovering amazing things along the way! I just love Geology! And it’s everywhere – from the glass on the windows to the lithium in your phone battery. If it can’t be grown, it’s mined. That is a great question. I would say my philosophy in life is to live it. I pride myself on having drive and passion in almost everything I do. It pushes me to do better and to achieve things that I would never have thought I could do. Brandon can be a very easy place to feel comfortable and content, but a push is all you need to go out and see the world! Trust me – there are so many amazing things out there, just let them draw you in! I also believe strongly in loving people, regardless of who they are. As a Christian, I believe that God has called this upon me and has given me the personality and opportunities to meet and love on so many people! Especially at this University! We need to spread ‘dat love like Nutella on toast! We could all use a little more love and a little less stress (lol). Long term, I have no idea where I see myself. I will leave that up to God; but fingers crossed, it’s somewhere in Europe. But as to what I am doing in the short term, I have one more year left to finish my Honours Thesis at Brandon University, so If you see me in the hall, feel free to toss me a high-five(lol)! After completing my undergrad at BU, I intend to get a master’s degree and have been looking into many programs in Europe and Canada. After my master’s, I hope to be a Professional Exploration Geologist. I have been so blessed with the amazing education from BU’s Department of Geology. The professors are so amazing and have been a fundamental part in creating the woman I have become. Their support and effort in creating a successful future for us students is phenomenal. I believe it will also allow me to have great confidence in myself and my competence as a professional Geologist, especially since it is a male- dominated industry (with an estimated representation of 34% women in 2013). If it wasn’t for the Geology professors, and Peter Adamo, Kelley Mitton, and all the other amazing support that I have gotten throughout my education, I know one thing for sure about my future: it would not be shining bright like the diamond it is. Taylor McPherson is a third year Geology major. Taylor is consistently at the top of her classes, intelligent and enthusiastic. She volunteers at the Brandon University Micro-analytical facility, with Let’s Talk Science, and for outreach, short courses and tours for University. She was president of the Western Inter-university Geology Conference committee, who recently organized and hosted the conference here in Brandon. The conference was a resounding success. 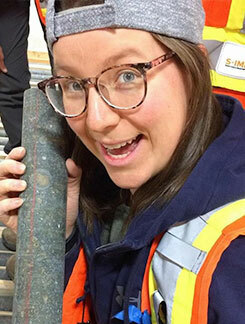 She was selected to represent the University at the Student Industry Mineral Exploration Workshop, where the brightest students from all across Canada learn networking skills, and about the resource industry. She is an active member of the Brandon University Geology Club and helps first and second year students to feel welcome and get involved with extra-curricular events and activities. When not at the school she stays active by playing women’s rugby, hiking and mountain biking. I believe she is a great role model for both female and male students and is an exceptional candidate for this award.